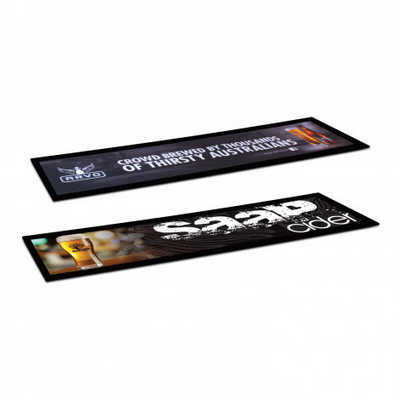 Robust large counter mat which is ideal for point of sale advertising in all retail locations including bars and restaurants etc. The low profile rubber base will not slip or slide and the anti pilling polyester surface is absorbent. Handwashing is recommended to maximise the life of the vibrant full colour print. Colours: Black. Dimension: L 880mm x W 250mm. Print Description: 840mm x 210mm (plus bleed if required). Print Type: Sublimation Print. Packing: Loose packed. Price includes : Sublimation Print. Setup is included.